Oh, how I love the return of comfort food! The heat wave has finally starting to break around here and you can actually feel autumn in the air! Naturally, that calls for homemade soups, stews, casseroles, pot pies, and of course, macaroni and cheese! 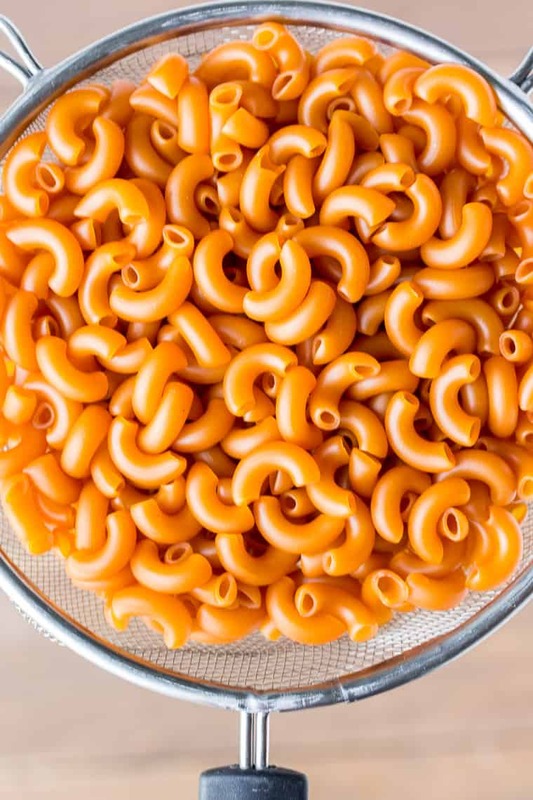 Will thousands of variations of mac and cheese out there, I decided to give a classic version my own fun spin. A favorite recipe of mine growing up was chili mac and cheese. It’s basically a combination of chili and macaroni and cheese in one glorious baking dish! This Baked Mac and Cheese recipe is topped with Chili-Roasted Sweet Potatoes. You still get the chili flavor, similar to chili mac and cheese, but without the meat. Yep, this recipe is 100% vegetarian! 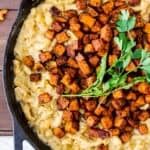 This Chili-Roasted Sweet Potato Mac and Cheese has a few unique qualities to it. For starters, you’re getting good-for-you sweet potatoes in every bite. Those sweet potatoes not only serve up the chili spice, but they also add a burst of sweetness that works so well with the cheese, chili, and pasta! Another quality that gives this Baked Mac and Cheese recipe a little something extra comes from the pasta. I use Modern Table Elbows pasta, which boosts the protein in this dish quite a bit! What is Modern Table Pasta? I’m glad you asked, because I am really excited about this product! All Modern Table pastas are lentil-based and contain complete proteins – meaning they have the 9 essential amino acids our bodies need for strong energy, good digestion, and muscle health. The ingredients contain only 3 plant-based ingredients. 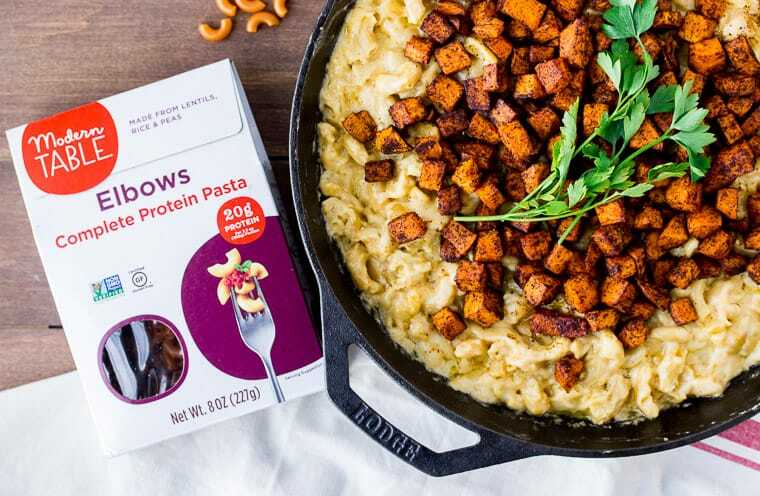 The plain pastas are vegan, non-GMO, and gluten-free. 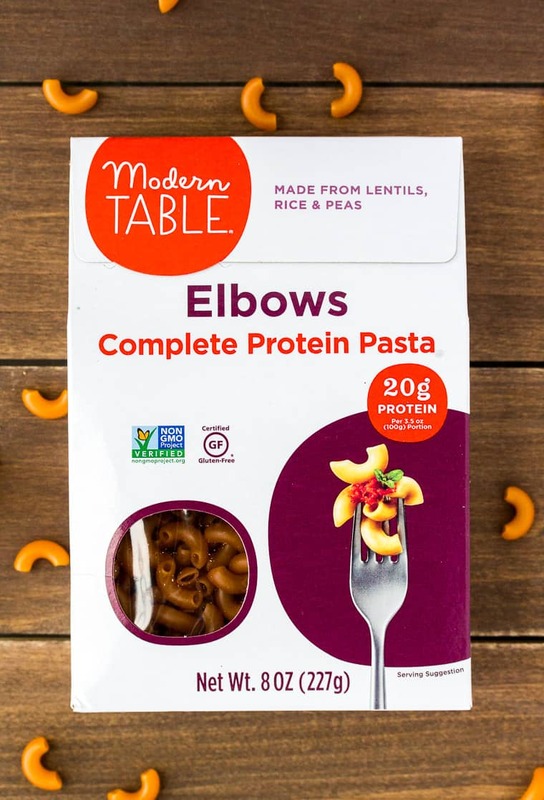 Modern Table pastas are for those looking for a healthy lifestyle, and a perfect way to get more nutrition from your meals. The pasta is full of nutritional benefits, yet with the classic texture pasta lovers know and love. While I used Modern Table Elbows in this recipe, there are a total of 4 different pasta shapes so you can mix and match to create your own picture perfect dishes! Use the promo code 25pastamonth to save 25% off of your order Modern Table pastas from Amazon.com! There’s a little bit of prep work for this recipe. 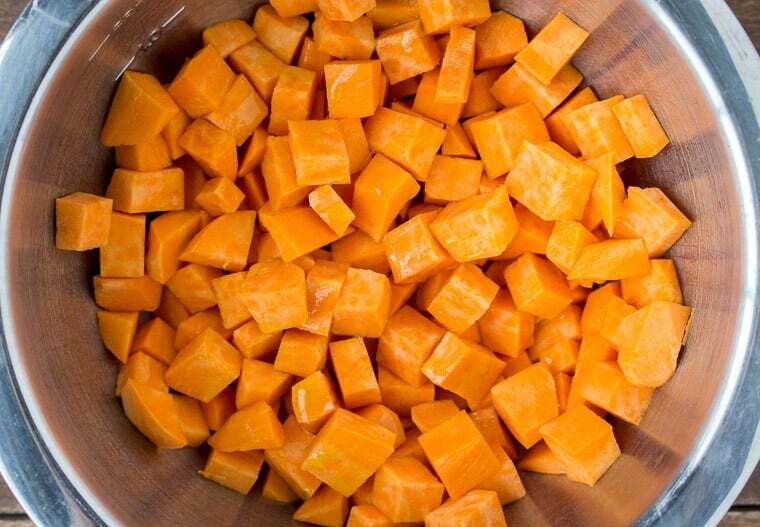 You will need to dice your sweet potato into about 1/2″ cubes. Also, shred the cheese. Please do not use bagged pre-shredded cheese. 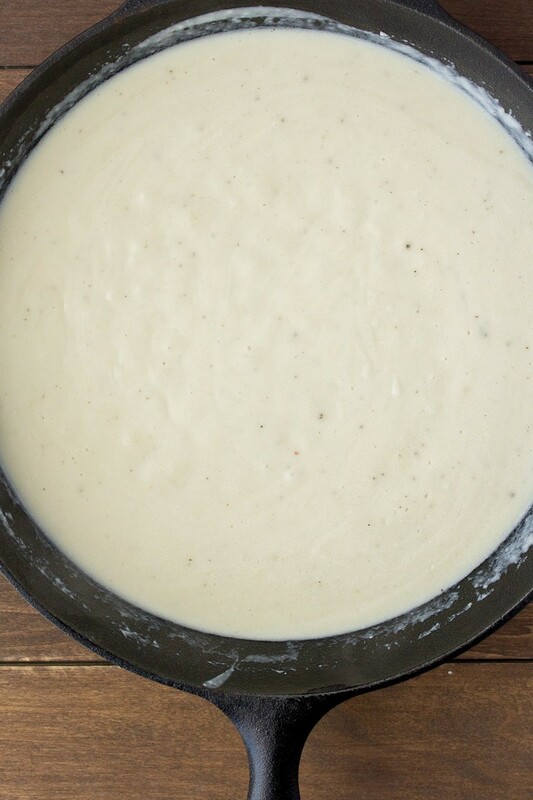 It contains added ingredients that will ruin your cheese sauce. Preheat your oven to 350°F and set a medium pot of 8 quarts of water over high heat to boil. 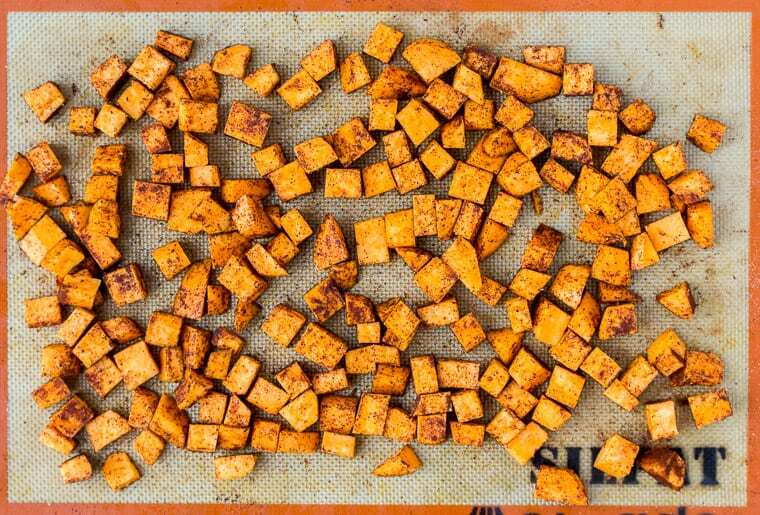 Add the sweet potatoes to a medium bowl and toss with the olive oil. You can put them directly on the baking sheet and add the oil, but I find that using a bowl is easier. Pour the potatoes out onto a baking sheet. I line mine with a Silpat mat to prevent sticking. Season with salt and pepper, then sprinkle on the chili powder. Toss to coat and set aside. Once the water comes to a full boil, add the Modern Table Elbows pasta. Cook until al dente, about 6-7 minutes. Drain, but do not rinse. 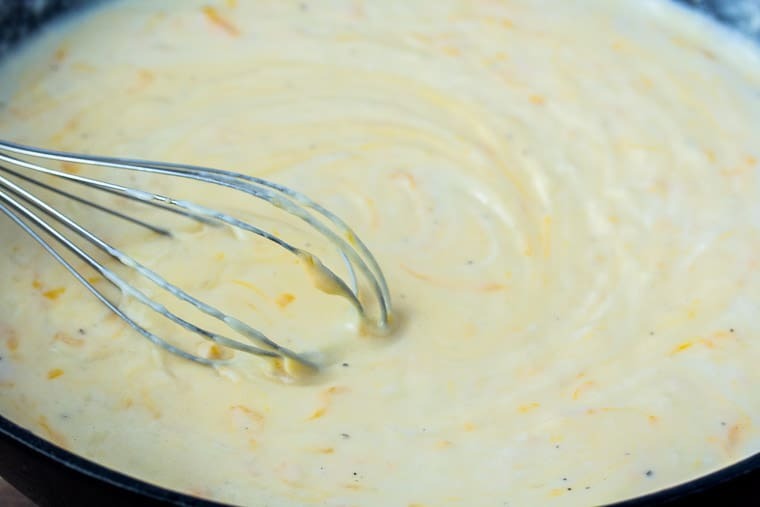 While the pasta is cooking, begin preparing the cheese sauce by melting the butter in a large oven-proof skillet over medium heat. You can use a regular skillet if you don’t have an oven proof one, but you’ll need a baking dish later. Gradually whisk in the flour until everything is nice and smooth. Slowly add the milk, about 1/2 cup at a time, whisking frequently. 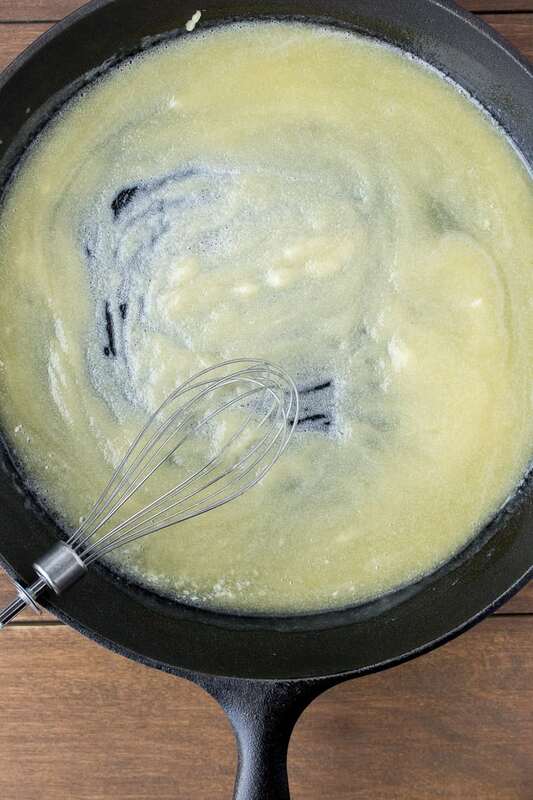 Add the salt, pepper, and mustard powder and continue cooking, stirring often, until the mixture is thick enough that you can draw a line through it with a spoon, about 5 minutes. Remove the skillet from the heat and stir in the cheese. Add the pasta and toss to coat. This is a good time to taste test your mac and cheese and adjust the seasoning , if necessary. 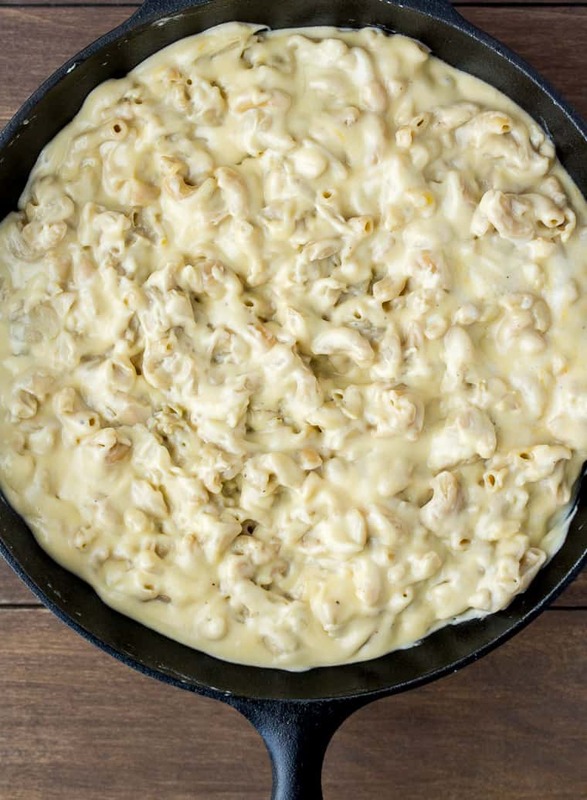 If your skillet isn’t oven-proof, transfer the mac and cheese to a baking dish. 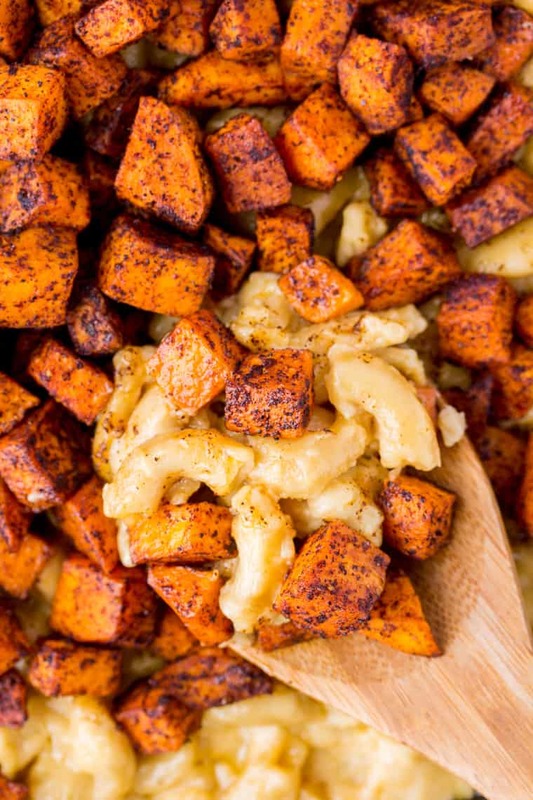 Place the sheet pan with the sweet potatoes and the skillet with the mac and cheese into the oven and bake for 20-25 minutes, until the sweet potatoes are fork tender and the mac and cheese is bubbly hot, but not browned. Top the Baked Mac and Cheese with the Chili Roasted Sweet Potatoes. For the best results, shred the cheese from a block. 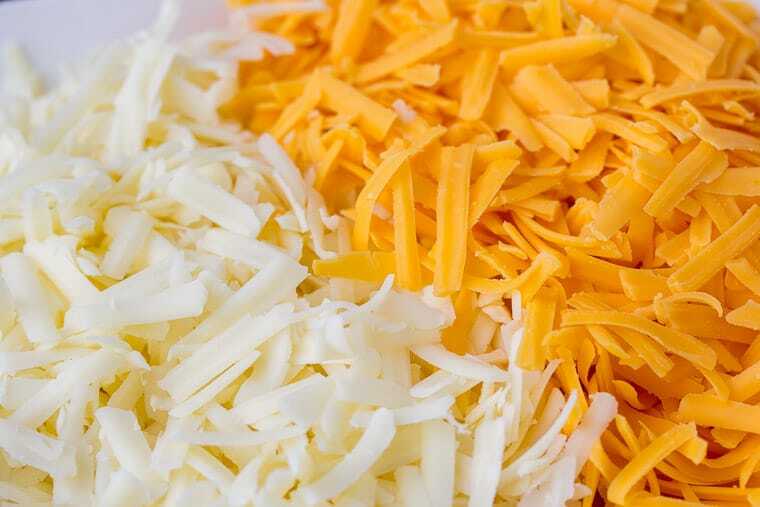 Do not use bagged shredded cheese as it contains cellulose which will likely ruin your cheese sauce. You can skip baking the mac and cheese. In this case, get the sweet potatoes roasting first, then begin preparing the mac and cheese portion of this recipe. You can bake the mac and cheese in 8 individual-size baking dishes. Decrease the baking time to about 15 minutes for this method. This recipe is not gluten free, due to the addition of the all purpose wheat flour. I have not yet tested a gluten free version, but many others have suggested using amaranth flour in place of the wheat flour. 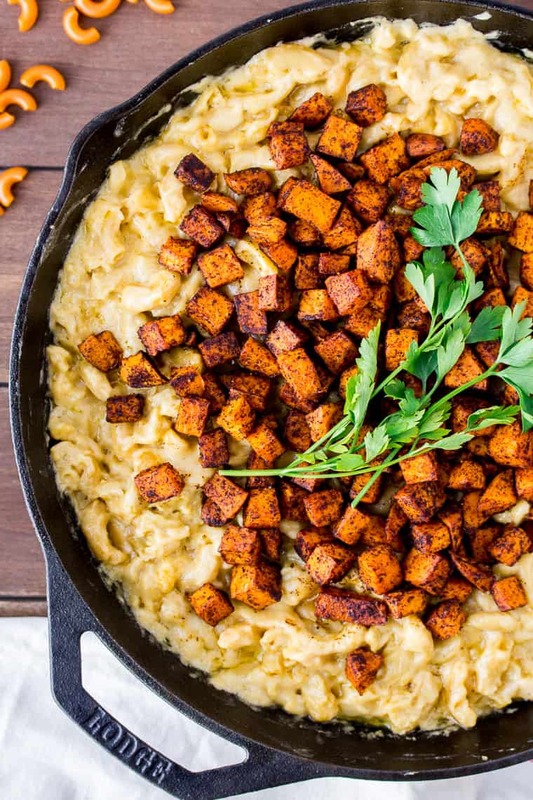 Can You Freeze This Chili Roasted Sweet Potato Mac and Cheese Recipe? You can absolutely freeze the two components of this dish, but it is recommended to do so separately. 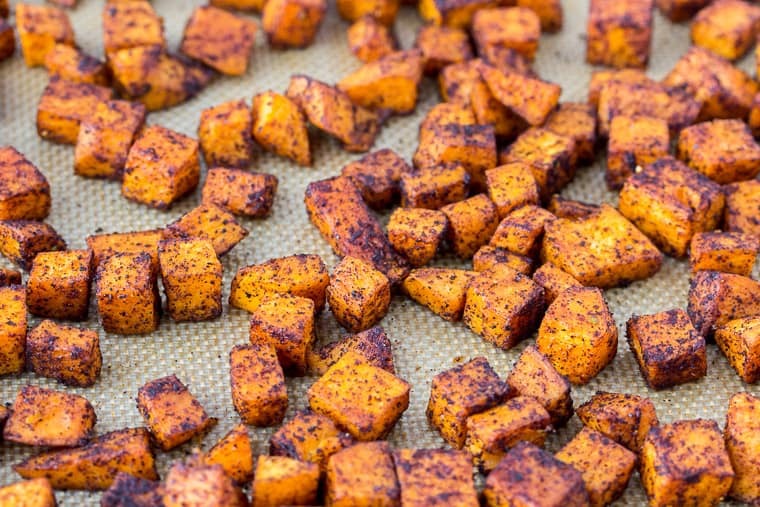 You can freeze the sweet potatoes by letting them cool, then adding them to a freezer bag. Remove as much air as possible from the bag before sealing. To reheat, add the potatoes to a baking sheet and cook at 350°F for about 15 minutes. The mac and cheese portion of this recipe can be frozen as well. Again, let it fully cool, then freeze in a tightly-covered casserole dish. Reheat in the oven at 350°F for 45-60 minutes. For best quality and flavor, use within 2 months of freezing. 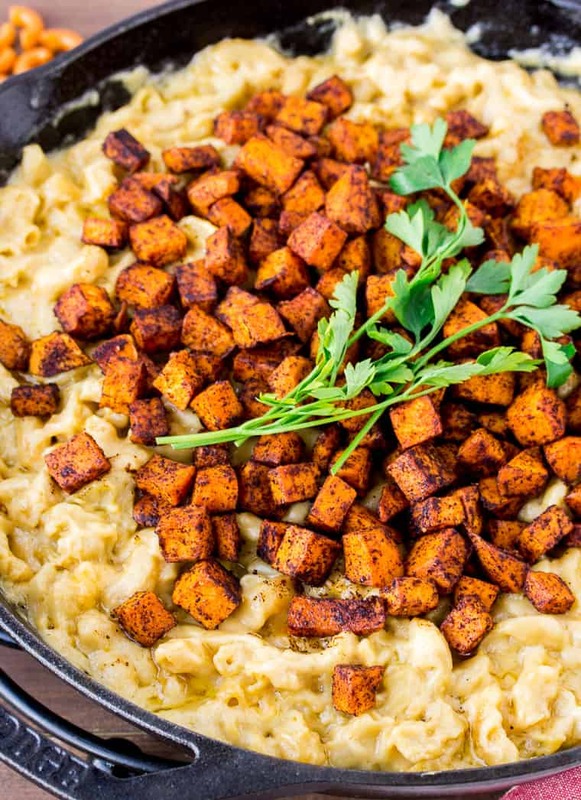 Love this Chili-Roasted Sweet Potato Mac and Cheese recipe? Follow us on Pinterest, Instagram, and Facebook for more! It is recommended to freeze the sweet potatoes and mac and cheese separately. To freeze the sweet potatoes let them cool, then add them to a freezer bag. Remove as much air as possible from the bag before sealing. To reheat, add the potatoes to a baking sheet and cook at 350°F for about 15 minutes. 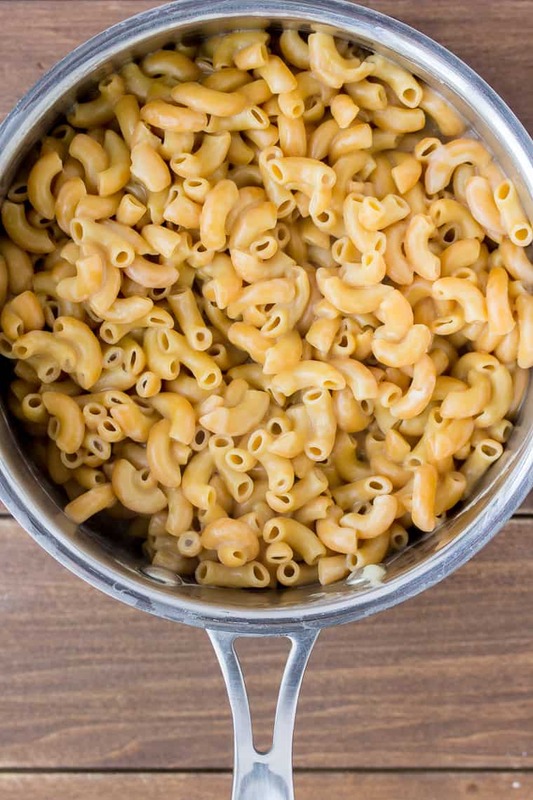 To freeze the mac and cheese portion of this recipe let it fully cool, then freeze in a tightly-covered casserole dish. Reheat in the oven at 350°F for 45-60 minutes.